…when ye fast, be not, as the hypocrites, of a sad countenance. For they disfigure their faces, that they may appear unto men to fast. Verily I say unto you, they have their reward. But thou, when thou fastest, anoint thine head and wash thy face, that thou appear not unto men to fast, but unto Thy Father who is in secret; and thy Father, who seeth in secret, shall reward thee openly. Today we begin the Nativity Fast, and we must look ahead to the temptations ahead and make a firm resolve to be cheerful and spiritually attentive. A lot of Orthodox Christians who sincerely try to keep this fast (which all too many neglect!) find it harder to stay motivated and cheerful during this season than during the Great Fast before Holy Week. The temptation to be discouraged arises for several reasons, and when we understand them and take action, the Fast goes much better. Secondly, we also suffer from the distraction of the obligations imposed (really or seemingly) by the secular “holiday season,” when a lot of people become obsessed with buying presents they cannot afford for people whom they fear will not like them, all the while trying to project good cheer at an exhausting round of obligatory and superficial social gatherings. The baptized soul and mind of the Orthodox Christian who is sincerely looking forward to the Feast of the Incarnation of the Word cannot help but feel burdened by the crushing meaninglessness of this exercise in futility, this absurd chase after a “good cheer” which keeps retreating with every shopping trip and every drink at some party imposed by work or social contacts. One mental exercise I have used in the past, when I had a secular job and was forced to interact more continuously with the world, is simply to look forward every day, with longing, to an intermediate goal before the Orthodox Nativity – to 12/25 December, the ancient feast of St. Spyridon (and more recently, especially for our Russian-American brethren, St. Herman of Alaska). 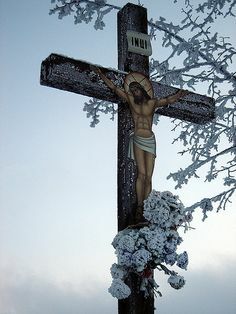 I think that most of us “veteran” Orthodox know the feeling of relief that I always have on that day, when the madness of phony Christmas finally dissipates, and we can look forward to a quiet thirteen days to prepare our souls with prayerful vigilance for the Great Feast we are about to celebrate. Having an intermediate goal is encouraging – it is like having incremental goals in an exercise or diet program rather than just looking ahead to the final outcome. Motivated by this, we make a more strenuous effort to take the Jesus Prayer with us throughout the day, so that even in the midst of “holiday season,” we can keep our hearts pure. Finally, we also feel the social pressure created by anti-Christian power elites who claim that Christmas decorations, greetings, school events, and TV programs that explicitly celebrate the Birth of Christ (the ones that are respectful and not blasphemous) are “unfair” to non-Christians, while non-Christian symbols and customs must be imposed on everyone, especially the Christians, in order to “celebrate diversity.” We know, of course, that this word “diversity” is Newspeak which means the opposite of diversity. It is code language that really means the depraved – not to mention boring and extremely stupid – mono-culture of globalism: a numbing, flattening uniformity of materialism, sensuality, and the ever-despairing power struggle for the “survival of the fittest” in a merciless, endless, and impersonal universe. We fight this most effectively by prayer first of all – it does not do any good to rant about the leftist “war on Christmas” on Facebook if you are not even saying your evening prayers. With the foundation of prayer and an attentive spiritual life, we can smile and cheerfully say “Merry Christmas” to the poor fellow human beings around us, for whom such a simple, old-fashioned greeting may be the only ray of light in a very dark day. +Go to more services (When is the last time you went to Vespers on Saturday evening or got up early on Sunday to go to Matins?). +Force ourselves to be cheerful and kind to everyone (especially tired retail clerks!). +Say “Merry Christmas” and refuse to be intimidated by the “diversity” propaganda. +Keep thanking God for everything we have and not get caught up in consumerism. Keep our shopping and present giving simple, in order to focus on the Birth of our Savior, and on sincere love for our family and friends, which is the real purpose of the gifts, anyway. A blessed Nativity Fast to all! Since God is peace surpassing every mind, it is necessary that the heart which desires to receive Him be peaceful and undisturbed. As David has said: “His place has been established in peace (Ps. 75:2).” Hence you ought in the first place to establish your heart in a peaceful state. Before everything else, have that peace and staidness in your five senses. That is, do not look or talk or move your hands or walk disturbedly, but in a peaceful and orderly manner. For when you become accustomed to preserve that peace in your outer movements, you shall easily and effortlessly be led to a peaceful inner state. For according to the Fathers, the inner man conforms to the outer man. Accustom yourself to love all men and be at peace with all, if this is possible, as Paul says: “If it be possible, as much as lieth in you, live peaceably with all men” (Romans 12:18). Guard your conscience so that it does not accuse you with regard to anything, but rests at peace in relation to God, yourself, your neighbor, and external things, and especially does not accuse you that you have neglected some commandment of God. For the guarding of the conscience begets peace of heart. Accustom yourself to bear insults without being disturbed.